Despite the use of these conceptual models by the U.S. military and others, by doctrine writers and military theorists, as well as their presence in military curriculums, both tools have features that undercut their usefulness. In fact, a strong case can be made that the utility they offer to the military and their political masters can be more negative than positive. Conceptual models, however, do have their place. This article proposes to replace both the phases of operations and the spectrum of conflict concepts with a single model, the War Cycle, that builds on their existing utility but removes their deficiencies. The utility of the Phases of Operations and the Spectrum of Conflict has always been questionable, despite their frequent employment. One commentator called the phases of operation the Operational phases “the albatross of military planning.” Both have significant flaws: their linearity belies war’s complexity, and their division of war into distinct parts denies its holism, since war is rarely an orderly progression from left to right or bottom to top with distinct boundaries between phases. As Colin Gray has stated, “Warfare is warfare, period.” Likewise, it is a gross simplification to label war as a particular type of conflict, because the reality of war is often complex. Nor do wars remain unchanged over their course. The Franco-Prussian War provides a case study in how dramatically a war can change over time. It began as a conventional war between peer competitors and evolved into an insurgency campaign with a simultaneously waged civil war. Charles Krulak’s three-block war idea more correctly captures the dynamism that is war and the need to avoid simplification. Recent events have further muddied the Western view of war. The term grey zone has been coined to describe the tactics employed by China and Russia. Cyber war and social media exploitation offer the opportunity to achieve goals using means below the threshold of violence, adding other dimensions to the character of contemporary war. These domains are also not necessarily the exclusive remit of the military. Other government agencies might more profitably manage actions in these domains, even at the cost of diluting the primacy of the armed forces as a lever of state power. …it is a lack of historical awareness that makes war in the grey zone appear new. The grey zone represents the coining of a new label, and its adoption highlights another problem with the spectrum of conflict in that it encourages practitioners to not treat war as a whole, even though grey-zone tactics have a long history. As Antulio Echevarria has observed, it is a lack of historical awareness that makes war in the grey zone appear new. For example, long before Russia’s seizure of the Crimea, the United States was employing grey zone tactics against the Sandinistas in Nicaragua. The identification of the grey zone is reminiscent of the last new thing in war, hybrid war. One need only consult the essays in the book Hybrid Warfare: Fighting Complex Opponents from the Ancient World to the Present to see case studies dating back to Roman times; hybrid war is hardly anything new. 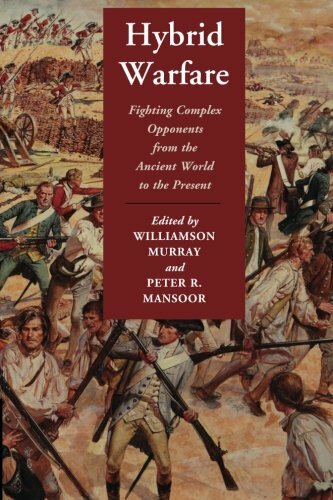 In his contribution on hybrid war and the American Revolution, Williamson Murray outlines the mix of conventional and unconventional tactics that brought the revolutionaries victory. Raids carried out by guerrillas, the harassment of British rear areas, the terrorizing of loyalists, and the waging of pitched battles were all employed by the revolutionaries to achieve their aim. In the book’s conclusion, Murray suggests the most obvious lesson to take from the book’s case studies is the calculations for the waging of hybrid war are the same as for any type of war. While the list of special kinds of war, each encouraging particular responses, is seemingly endless, war is just war. While the military’s resort to the phases of operation and the spectrum of conflict models suggest they have some utility, their deficiencies outweigh their benefit. Their greatest limitation is not that they misrepresent the complexity of war, as mentioned above, although this is significant. Rather, they encourage the consideration of aim, strategy, and operations as separate activities whose oversight rests with different bodies. This bifurcation separates the reason for going to war from the manner in which it is conducted and leads to situations where combatants fight wars without end. In Western democracies, there is an accepted division of responsibility: politicians are supposed to set war aims and provide the resources and the military commanders are meant to decide upon the use of the means. However, these roles are not meant to exist in silos. Great war leaders and generals such as Abraham Lincoln and Ulysses S. Grant knew how to communicate and act across the divide. The phases of operations and conflict models tend to enhance the division; a tool that encourages a more cohesive method is needed. The utility of any approach that divorces the aim from the effort is misguided and counterproductive. The aim is paramount in war. The aim is the objective those choosing war want to obtain. It is one of the fundamental truths of the unchanging nature of war and reinforces the observation that war is a political act. For this reason, the identification of the aim is the starting point for any attempt to compel an adversary, by any means, to accept your will. It is not surprising that many militaries include the selection of aim amongst their principles of war. Because of its paramount importance, the aim is at the top of the war cycle, and its determination must precede the commencement of any operation. In coalition operations the aims of each participant do not have to align totally, but they must at least be compatible. If there is no aim, then the War Cycle cannot function. Competition & Cooperation: The state or non-state actor employs operations, mainly in the cognitive domains, to convince the adversary to agree to its aims. Personnel and equipment from non-military organisations may also be featured, such as the use of civilian fishing boats to hinder another party’s access to contested waters. The emphasis here is on non-kinetic effects utilising cyber, social, and electromagnetic techniques, although violence and casualties may result as actions taken cause internal disturbances and social stress among the targeted population. There is also no range limitation; operations in cognitive domains are global. Nuclear deterrence theory also has a place in this phase, for those states possessing such capabilities. The participating agencies for many of the operations conducted are likely to be non-military, and the desire and ability to sustain a whole-of-government effort is essential for success. Distant Force: This stage represents an increased resort to kinetic effects and a greater role for the military as compared to the previous stage, rather than an increase in effort. Modern missile and sensor systems have enabled competitors to create killing zones that extend outwards from their borders for thousands of kilometres. As in the First World War, an attacker will need to suppress the enemy’s ability to interdict its approaches with lethal fire before friendly forces can maneuver in and across the killing zone. Importantly, distant force represents the projection of effects over great distance and not the projection of people. While this stage contains kinetic missile strikes, cognitive attacks may also be evident as an adversary brings its distant strike capabilities to bear. This stage could also include the use of proxies to fight or the incitement of an internal opposition within the adversary’s homeland. For the proxy it would be the close force but for its supporter it would be another aspect of the distant force. The lead agency is the military but other government agencies provide support. Close Force: If distant force represented the projection of effects, close force represents the projection of people. This is the stage most familiar to members of the military who have the largest role for the military in its conduct—the maneuver of force elements into contact with the enemy. However, to achieve success in the close force stage the struggle for the distant force stage must first be won. The projection of people may require the crossing of the enemy’s killing zone. If people are to cross this killing zone within operationally and socially acceptable casualty limits, the battle for the distant force stage must be won. Soldiers, ships, and aircraft—even robotic ones—will not be able to close with the enemy without the elimination or suppression of the enemy’s ability to dominate the killing zone. it should be recognised that not all opponents will have the ability to establish killing zones, but those that do must be treated with respect. If not, tragedies such as the slaughter of nearly 20,000 British soldiers on the first day of the Battle of the Somme or the enormous loss of life suffered by the Army of the Potomac at Fredericksburg are destined for repetition. Nuclear Force: Since such weapons exist, it is necessary to include the possibility of nuclear war in the war cycle, but its occurrence can only be considered a failure, particularly against a peer competitor that also possesses these capabilities. Nuclear weapons only have utility as a deterrent and the focus of their consideration should be in the competition and cooperation stage. It may be possible to conceive of a situation in which a combatant can employ these weapons, but the danger is too great to plan their use. There is no achievable aim, other than the deliberate ending of civilisation, which can involve nuclear war. Nor is it likely nuclear annihilation will result in a better peace. There is a progression of increasing risk to personnel as one proceeds from the left to the right, but this progression does not pertain to intensity of operations, war effort, or national commitment. Rather, it pertains to the risk to the lives of military personnel and civilians, both one’s own and those of one’s adversary. The goal of the first three stages is a better peace, and this aim is attained when the adversary accepts your will. As B. H. Liddell Hart has written, “the object of war is a better state of peace,” although the nature of the peace may be point-of-view dependent. Peace is not a stable condition, as the struggle between peoples may not end with the cessation of operations. Over the long cycle of history a new aim often emerges and the process begins all over in a never-ending cycle. While the four stages may give the impression of a linear progression, that is not the case. Instead, the War Cycle is dynamic. At every stage, there is opportunity to move in the other direction and adjust the means employed to achieve the aim. This feature is essential because movement to the right comes with greater risk to life, ultimately ending in nuclear force if escalation is not constrained. There is a large literature on limited nuclear strike, if such a thing is possible, but even a hawkish president such as Ronald Reagan has stated that a “nuclear war cannot be won and must never be fought.” At every point in the war cycle, combatants must strive to de-escalate the lethality of their methods to limit the loss of life and the destruction of infrastructure in the constructed world and damage to the natural systems on which humanity depends for its survival. The War Cycle is a conceptual model for our time. Critically, it restores the link between the aim of war and its conduct. It makes clear that if one has not articulated an aim, the outcome will likely be a failure of politics accompanied by the loss of life, a sacrifice without purpose. Without an aim, initiating a war is a misuse of one of the most powerful levers of government power. This model also regulates the intensity of risk by providing off-ramps for de-escalation. The model has another important attribute. Too often those of the West view war and peace as a binary state of being—either you are at war or you are not. Related to this is the false belief that war requires violence. This has never been war’s reality. It is not an end state but a condition of humanity, and peace is a temporary interlude between contests. Where possible, states and non-states have achieved goals without a resort to force, although the implied threat of violence may be present. The Chinese have demonstrated skill at staying below the threshold of military force in fortifying their claim to much of the South China Sea. The weaponisation of cyber and social media makes the realisation that war is a constant condition more important than ever. States and non-states can now attack and achieve aims without the use of kinetic capabilities, as the recent Russian interference in U.S. democracy demonstrates. Too often those of the West view war and peace as a binary state of being—either you are at war or you are not. When considering the military exploitation of the cognitive space, it is useful to remember that when war transitioned from muscle powered swords and pikes to chemically powered muskets and guns, there was no debate that the new age was not still war. This earlier transition took centuries to play out as firearms gradually came to dominate. Today the transition is playing out in decades. New technologies have allowed adversaries new methods to achieve aims. That these means may not include explosions and bloodied and broken bodies does not detract from the fact that at its nature war remains the same. Albert Palazzo is the Director of War Studies at the Australian Army Research Centre. The views expressed here are the author’s alone and do not necessarily reflect those of the Australian Army or the Australian Department of Defence. Gustov A Otto, “The End of Operational Phases: At Last,” Interagency Journal, 8:3 (2017) p. 8. Colin S Gray, Another Bloody Century: Future Warfare, London, Phoenix Books, 2005, p. 370. Antulio J Echevarria II, Operating in the Grey Zone: An Alternative Paradigm for U. S. Military Strategy, Carlisle, Strategic Studies Institute, 2012, p. xii. David Ronfeldt and Brian Jenkins, The Nicaraguan Resistance and U. S. Policy, Santa Monica, Rand, 1989, pp. 14-23. Williamson Murray and Peter R Mansoor, Hybrid Warfare: Fighting Complex Opponents from the Ancient World to the Present, Cambridge, Cambridge University Press, 2012, p. 307.